Guess I can't leave anything alone. A while back I picked up a new cable modem. However this one just didn't seem to be as stable as my previous one. This one also ran noticeably warmer. I assumed the heat was most likely the cause of my problems and decided to modify it a bit. 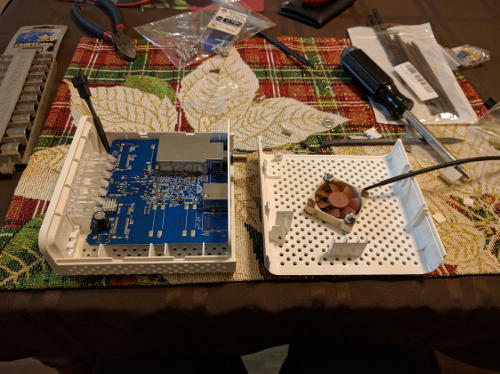 I picked up some Raspberry PI heatsinks, and a 40 MM fan. 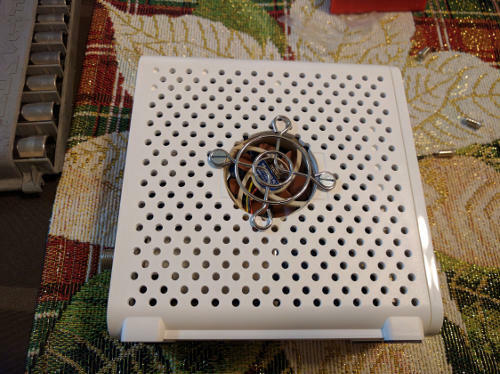 This is the underside of the cable modem. The silver heat sinks I added. 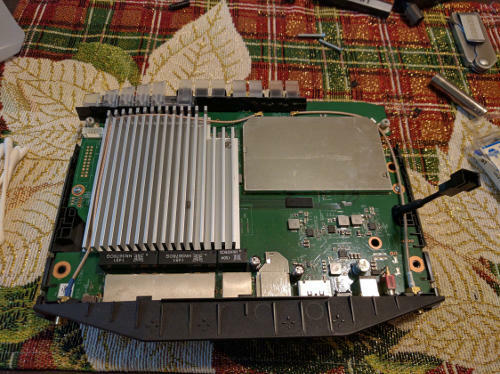 This side it was primarily just to memory chips. The big heatsink is on the CPU that was existing. This would have been the ideal side to have the fan, but the fan would not fit inside the case on this side. I added the fan connector to the power leads here as this modem runs off 12 volts, as do most. 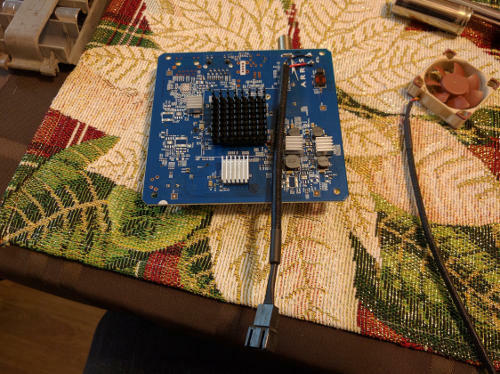 Using a connector like this will allow me to easily replace the fan if I ever needed to. One more heatsink on the top side added to a MOSFET just for good measure. May have not been needed, but they were cheap. The fan pulls air through the enclosure. From the outside it's the only thing that looks any different. There is definitely a huge temperature difference. It now feels nice and cool when you put your hand near it. It also has not slowed down yet since doing the modification. I would call this a success for a quick, easy, and cheap modification. 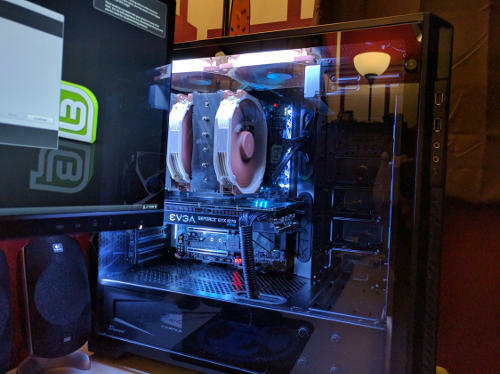 could you have mounted that muffin fan on the outside of the case and on the opposite side so that it would be drawing air out of the case and away from the CPU and other components? If you were to push air into the case it might take the heat from the CPU and distribute it throughout the case before pushing it out, thereby heating up everything in its path. Might also pump dust into the case and a build-up of dust creates an insulating layer that raises the temperature of individual components. I try to remember to open the case on the computer and clean at least once a year. It is amazing how much dust collects in there. And computers that sit on the floor accumulate dust even faster. I briefly thought about that, however mounting the fan on the outside would have been really ugly. This way at first glance nothing looks amiss, as the modem sits on the bottom of the entertainment stand in the living room. I figured if everything got hot I could flip the fan around, but so far, the entire thing has stayed nice and cool, even after having one of my PC's downloading from Steam most of the night. 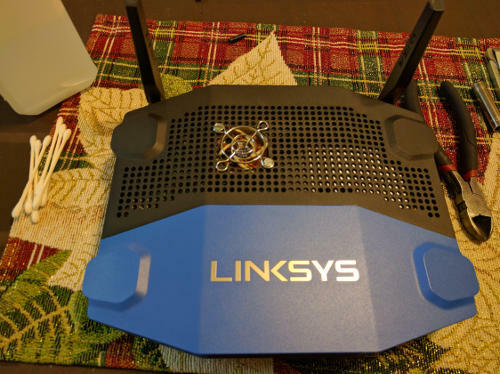 The fan couldn't be directly over the heatsink, but it still made a noticeable difference drop in the temperature on the router.